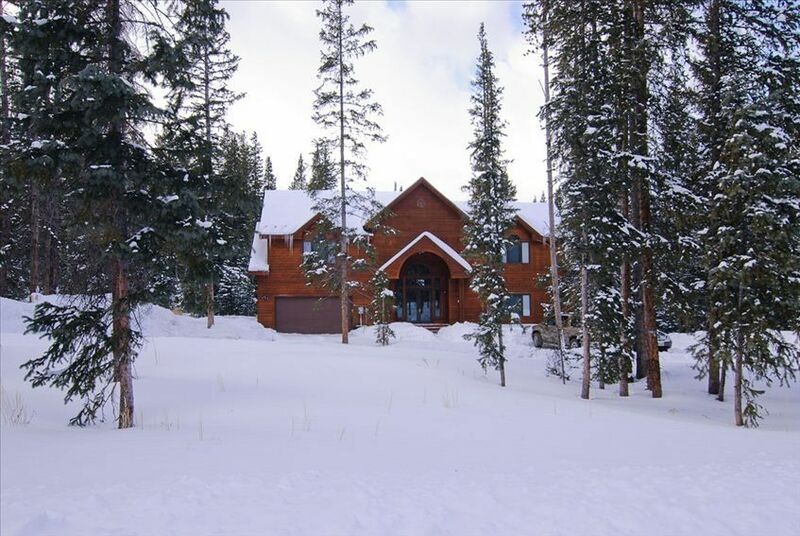 Mulitiple families and couples enjoy Breckenridge to the fullest at our Peak 7 Vacation Home. Privacy and quiet charm abound with a location around 2 miles from the ski lifts by car or 3/4 mile by path and 2 miles to downtown Breck. The wide open spaces in this house are sure to please with the national forest and Ten Mile Mountain Range as your back yard. Great views from all rooms! The open beamed great room that includes the kitchen allows everyone to be part of the experience. Relax outside on the deck, around the outdoor fire pit, in the large hot tub, or lounge by the cozy rustic wood burning stove in front of the 50” flat screen TV. Families, company retreat groups, and friends are going to feel comfortable in this spacious 4 bedroom with beds for ten guests. The second floor master bedroom is sure to please with a king bed, vaulted ceilings, dual vanity bath, and Jacuzzi tub, faux fire place, and flat screen TV with DVD player. The spacious main floor bedroom is set up with a beautiful king bed, sofa with twin pull out, faux fire place, and TV; the third and fourth bedrooms have a 'Jack & Jill' bathroom, with queen beds and bunks that sleep a total of 9. There is a loft in the fourth bedroom with twin bed for use if desired. Meal time for a large group is a joy with seating and set ups for 13 utilizing the dining table, bistro, and the kitchen island bar. 50” TV in the great room with DVD player, TV with DVD player in the bedroom on the main floor, TV with DVD player in room three. Board games and great books are there for you to enjoy as well. The basement is a 2 bedroom lock-off apartment that is rented full time. We want to share our dream home with you. Live in Michigan but get to spend a lot of time in Colorado. Fitness and travel are large parts of our lives. We have 3 adult children that all live in Michigan within 2 hours of us. We are proud of our Colorado home and really enjoy hearing how much the families that we get to share it with appreciate it. Breckenridge because it is a true mountain town that also has a ski resort. Summit County because it is close to Denver and easy to get to. Our house location on Peak 7 because it is so beautiful, quiet, private, one with nature, yet close to everything. Our house.....just look at the pictures. Location, Location, Location. Walk 3/4 mile through the national forest to the base of Peak 7 and the gondola. Back yard is the Ten Mile Range and the national forest. Famous Peaks Trail is just steps away. Cross country ski out the back door. Bike, hike, ski, fish, view moose, within steps of the door. Endless views, extremely private, and large flat piece of property. Parking for one in heated garage and parking for five vehicles on flat lot with circle drive. Dining, kitchen, and family room is one great room with a wall of windows overlooking the national forest and Peak 6 ski area. Board games, books, snow shoes, sleds. We took our family skiing and this house was perfect for our group of 7...and a 6 month old baby. We had an issue at the beginning of our stay but Tom was quick to resolve it. He was very kind and concerned about our comfort. We would most definitely recommend this home! The house was everything we expected and more. We will definitely be coming back. Clean, spacious, and beautiful home. Especially loved the hot tub! Amazing views right around the corner, easy hiking and sledding opportunities, and a 10 minute drive to downtown. Tom the owner was very helpful with any issues. Highly recommended! If paying with charge card an additional fee of 3% is charged. $4,150/month plus utilities non ski season.